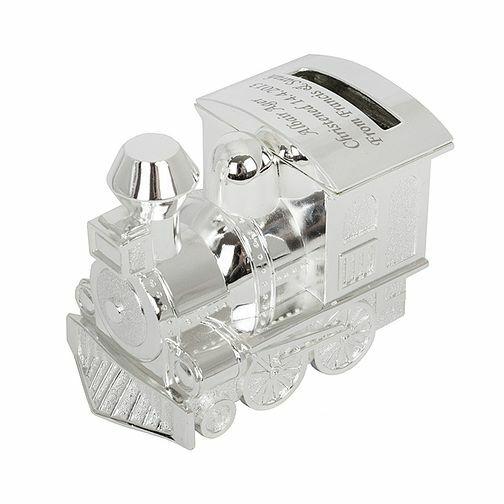 antastic gift to welcome a little boy aboard, this stunning silver finished loco train moneybox can be beautifully engraved with the words of your choice.Perfect for beholding pennies and those small savings! Personalised A Little Bit Special Train Money Box is rated 4.3 out of 5 by 6. Rated 5 out of 5 by Anonymous from Personalised train money box The product was silver, not too big and ideal for a christening gift. Personalisation made it extra special and made it a great choice from a godparent to gift. Rated 3 out of 5 by Anonymous from Keepsake rather than a useful money box This money box is too small for my liking (check out the dimension) I didn't and was so very disappointed with the size! but a lovely little trinket keepsake with nice engraving.